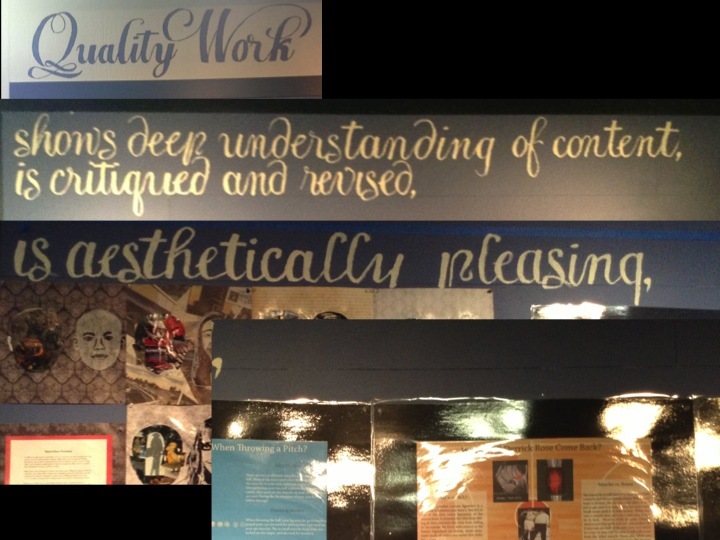 #QualityWork shows deep understanding, is critiqued, is revised, is aesthetically pleasing… and what else? What is your purpose and philosophy of displaying student work? Is it just something teachers have always done? What does the work you display show? To confess, there were times during my teaching when displaying students’ work was more about decorating a space, than visually articulating learning. My epiphany came on a visit to an architect’s office, when I saw how their current projects that were a work-in-progress on display for comment with collaborative input from colleagues while past projects celebrated success. It made me think differently about displaying student work. Taking the thought a little further, I was challenged by the aesthetics of visible learning over uniformity on a recent trip to USA visiting schools. Project based learning provides deep learning, engagement around passion and lends itself to the display of quality and diverse work. In some cases the students’ work was variations on a common theme, in others, it was celebrating passion and curiosity in unique ways. How does Beckham “Bend it”? What muscles do you use when throwing a pitch? How does spin affect the velocity of a football? So what was the final defining element of quality work? What were they going to write after the comma? Meaningful? Purposeful?